Welcome to the perfect and affordable small family vacation getaway on ever popular Lake Muskoka! This 800 sq. ft., 3 bedroom cottage is cute and as clean as a whistle with all the comfort conveniences of home. The cozy living room has beautiful lake views and a gas fireplace for cooler evenings and a ceiling fan to make for more comfortable nights on humid summer evenings. The well-equipped kitchen has lake views as well making it enjoyable while prepping and making meals. Although there are seating areas inside for snacking or dining, the place of choice on beautiful summer days will be the deck overlooking the expansive lawn and lake. The front or back lawn are great for the kids to play catch or throw a frisbee and the 25 feet of hard packed sand at the waterfront is ideal for young and old alike to safely splash and play. There are rocks marked by a green buoy in front of the property that can easily be swam out to and explored with a snorkel. You can stand on these rocks and the water will come up to your hips. With the property facing south enjoy plenty of sunshine from late morning to sunset. The property is located in one of the most sought after parts of Lake Muskoka, directly between the towns of Port Carling and Bala. St. Anne’s Catholic Church is a heritage building only two properties away where there is also a municipal dock, an excellent place to view sunsets! Boat parking is provided overnight at the adjacent boat house, with daytime parking available at the municipal dock, or right on your beach! The country road in front of the cottage is great for scenic afternoon walks or runs and for nature lovers keep your eye out for deer and blue herons, commonly sited weekly. Finally, for avid boaters, you can tour “The Big Three” (Lake Muskoka, Lake Joseph and Lake Rosseau). 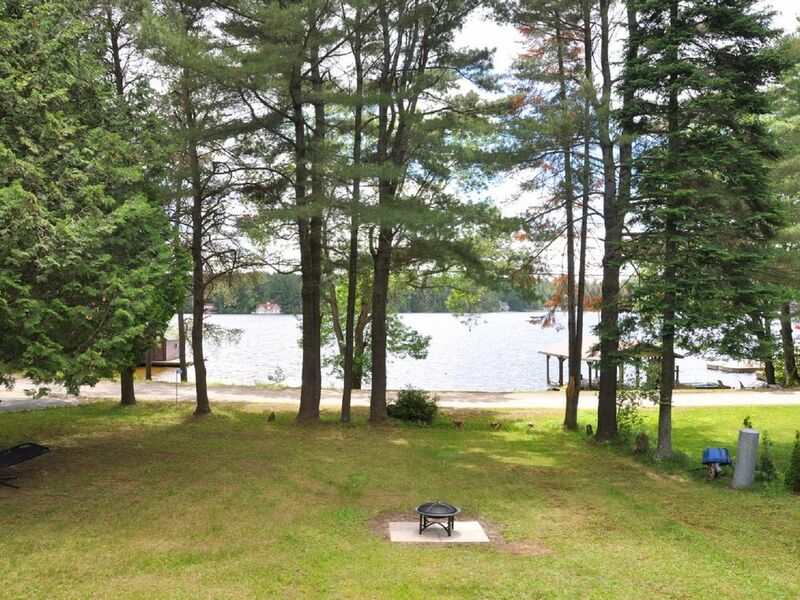 With it's central location, you can easily access Bala, Port Carling, Bracebridge, or Gravenhurst by lake! The lake also hosts frequent fishing derbies so needless to say keen fishermen won’t be disappointed. The rich cottage history of vacationing on this famous lake is sure to please the whole family! Essential toiletries are provided, including 4 towels, face towels, toilet paper, and hair dryer. Municipal Road runs through property between beach and cottage. Beach is private and part of the property. 4 Seats at Table with additional chairs available in cottage. Patio Set on deck with 6 available chairs. Canoe with paddles, lifejacket, marine kit provided. Large selection of golf courses available within 5 - 20 minutes of cottage. Perfect Family March Break Get Away! Our visit to Steve and Rachel's lovely cottage in Bala was the perfect Winter holiday! We planned a March Break get away with our daughters aged 9 and 10. The cottage had everything we needed, 3 good sized bedrooms, incredibly comfortable beds (is that a memory foam mattress on the king size master!). A propane fire place added to the cozy feeling as we watched the snow softly fall outside. The area surrounding the cottage was something straight out of a fairy tale, perfect for meandering after-dinner walks....we were lucky enough to see both a family of deer and a beautiful large owl! Even the gently sloping huge front lawn was a perfect sledding hill, right outside our front door! The fantastic location allowed us to take advantage of the nearby Muskoka Lakes Winery (neat outdoor, lantern-lit skate path), Hardy Park Hiking Trail, Torrance Barrens Dark Sky Preserve and Arrowhead Park (skate trail, hiking trails, tubing). Our host, Steve was in close contact anytime we had a question, eager to make sure we were happy and had what we needed. Our experience at Steve and Rachel's cottage was exactly the winter cabin holiday we were hoping for! Thank you Steve and Rachel! Winter Serenity in a Warm and Cozy Cottage! I decided to take my wife away up north for a mini-winter adventure for Valentine's Day. I booked Steve's cottage because it seemed to embody all that I needed for beautiful winter scenery while enjoying the cozy atmosphere of the cottage with its lake view and toasty gas fireplace. We drove up through a snowstorm to arrive Wed aftn. Once we got settled and turned on the gas fireplace, we decided to head out for a stroll around the neighbourhood. The snow was gently falling as our stroll through the snow-covered treelined roads was sooo quiet and peaceful! Steve's cottage has all the 'home' necessities for you to enjoy a home-cooked meal which is what we opted for. For Valentine's Day, we opted to head over to the Muskoka Lakes Farm Winery where cranberry is the order of the day! We enjoyed a cranberry beer and spritzer while we waited outside by the fire for our lunch. We were disappointed to learn that due to the excessive amount of snowfall, the trail was not open for us to do any snowshoeing. After enjoying a wine-tasting demo, we headed to Gravenhurst to stroll the streets and peruse through the many shops. We elected to have our Valentine's Day dinner early and settled on The Oar and Paddle - a delicious choice with healthy servings! After arriving back at Steve's cottage, we decided to go for one final night stroll through the neighbourhood. We took along with us one of the flashlights that Steve's cotttage provides to illuminate our way. An absolutely fantastic stroll in the absolute quiet of the wooded, snow-covered roadways by the cottage. We returned to the warmth of the cottage and that lovely gas fireplace! Thanks again Steve for providing us with a memorable mini-holiday!!! Thank you so much for your review Mark. I really enjoyed speaking with you. You and your wife were a pleasure to communicate with. We would love to have you back! Thanks, Steve. Fabulous spot and great winter getaway. Beautiful little cottage with a fabulous view of the lake. The cottage was kept up, very clean and comfortable. We stayed in the winter and the heat combined with the fireplace kept the cottage nice and warm all weekend. Sleeping arrangements are great. Big beds and a pull out couch. Kitchen was well stocked with plates/cutlery/pots and pans and almost anything you'd need if you're doing some cooking. Real close to the Muskoka Lakes winery for some awesome winter activities. If you're headed up in the winter, it's a MUST visit and only a 7-8 minute drive away. Thank you so much for you feedback Dan and sharing your experience. It was a pleasure having you and your family stay at our cottage and we would love to have you back! Many thanks, Steve. The cottage was clean and comfortable and a very nice view of the lake. Beautiful area, the trees were still nice and we went to the Cranberry Festival. The weather was uncooperative on Monday but we still explored the area. We had a lovely, happy time at Steve’s cottage, travelling with our baby son. We loved how the cottage is situated, up the lawn just off the lake with a perfect view from the high windows in the living room. The cottage offers privacy, but not loneliness with the surrounding cottages nearby - a plus for us. There are also other lakes and towns to be enjoyed nearby at a very easy distance, especially Port Carling. We further enjoyed the veranda with barbecue on the warm days, and the gas heating (works well!) on our cold day. Steve was very helpful and accessible for questions. All in all, a definite recommendation! Copious Commendation for "Cozy Cottage"
It is a pleasure for me to give a positive review of Cozy Cottage. My only regret is that we didn’t book a longer stay. I’m new to the cottage experience and wanted to try a 2-night trial run. Steve, the owner, is a joy to deal with. His ancestors were original Muskoka pioneers (over 160 years ago). He’s personable, professional and attentive. The evidence is in how immaculate he keeps this property, both inside the cottage and the outside grounds. He has thought of everything in terms of creature comforts, including a number of board games and DVDs in case of rain days. The location is incredibly beautiful, peaceful (September) and safe (a few neighbours live nearby which was comforting). The pristine lake is within view of the cottage, the deck (with table/chairs for six and BBQ), and, also from the grounds below where there is a fire pit. The furnishings including the beds are very comfortable and there are plenty of outdoor chairs as well. We really appreciated the water cooler, bedding and bathroom towels. There was less for us to have to pack. All four of us swam in the lake, which is easily accessed from the small beach and two of us used the canoe provided and had a wonderful experience. We used the BBQ (in good working order), but there is also a gas stove and microwave in the kitchen. In the evening we lit a fire in the pit, toasted marsh mellows and spent time gazing at the stars — what a spectacular view! We highly recommend this property and look forward to our next visit. Thank you so much Janet for the wonderful feedback! Being new to VRBO / HomeAway we appreciate your comments and hope others will see how wonderful your experience was and choose our cottage for their vacation getaway. It was a pleasure communicating with you and having you as a guest - we hope you come back again! Many Thanks, Steve. Many local attractions including the Bala Cranberry Festival, Summer Waterski Shows, Santa's Village, and more!